Carnegie Science Venture grants are internal awards of up to $150,000 that are intended to foster entirely new directions of research by teams of scientists that ignore departmental boundaries. Up to three adventurous investigations may be funded each year. The period of the award is two years, with a starting date within three months of the announcement of the selected projects. Awards will be distributed once yearly following the proposal and review process. Please submit your proposals to Anat Shahar at ashahar@carnegiescience.edu. Proposals will be confidential and will be seen only by the review panel and Headquarters staff in Development.Unless the scientists state a preference otherwise on their cover page, these proposals will be shared with the Development department after the review panel,for potential efforts to raise funds for the projects. Astronomer Andrew McWilliam of the Observatories has teamed up with Hubble Postdoctoral Fellow Johanna Teske of Terrestrial Magnetism to detect molecules important to the emergence of life on Earth-sized exoplanets. 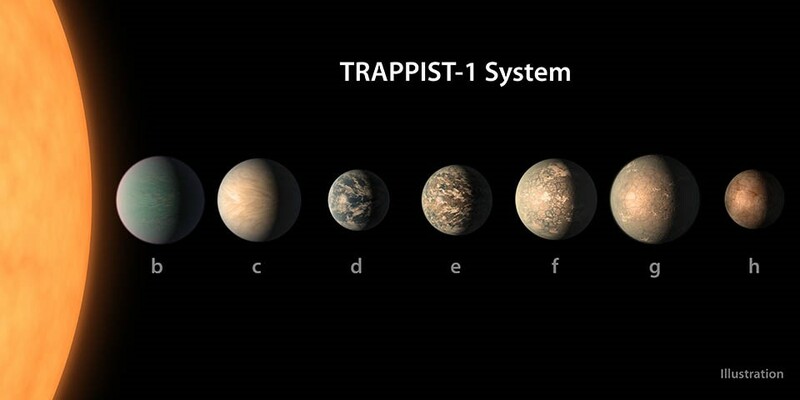 A priority target is TRAPPIST-1 system, with seven Earth-sized planets. They will analyze light transmitted through these exoplanet atmospheres as the planets move in front of their host stars, searching for the faint molecular fingerprints of species like water, carbon dioxide, and methane. The researchers will work with the world-class instrumentation team at Observatories to adapt a new, high-resolution near-infrared spectrograph, from the University of Tokyo, to be deployed on the Magellan-Clay telescope, and develop custom reduction and analysis tools for exo-atmospheric detection. A second grant was awarded to a collaboration among instrument designer Nick Konidaris of the Observatories and global ecologists Greg Asner, Joe Berry and Ari Kornfeld, to disentangle the faint light emitted by chlorophyll during photosynthesis from the much brighter sunlight reflected off the plant surface. This remote sensing technique, called Solar Induced Chlorophyll Fluorescence (SIF), can be used in ​applications​ ​from​ ​precision​ ​farming,​ ​to​ ​forestry,​ ​to​ ​ understanding and​ ​predicting​ ​global​ ​climate​ ​change.​ These methods can also be used to study low-surface-brightness features in nearby galaxies thereby advancing both ecological and astronomical studies. As a first step in advancing these two fields, a SIF instrument will be incorporated into the Carnegie Airborne Observatory to allow measurements of photosynthesis to be coupled with structural characteristics in unprecedented detail. The image at left shows chlorophyll fluorescence from photosynthesis at the molecular level. The Carnegie Airborne Observatory (CAO) can render height maps of forests, as in the image at right. Red in this image indicates the tallest plants. The team will use the remote sensing technique called Solar Induced Chlorophyll Fluorescence (SIF) to measure photosynthesis, coupled with structural characteristics from the CAO in unprecedented detail at large scales. A third Venture Grant was awarded to a project planned by plant biologists Zhiyong Wang and global ecologists Joe Berry and Jennifer Johnson, with Karlheinz Merkle of Stanford University to develop a new “gene gun” that can deliver biomolecules deep into plant cells that then participate in reproduction for the purpose of genetic manipulation. The new tool would be much quicker and more effective than current methods and could break a time-consuming bottleneck in plant research and biotechnology. 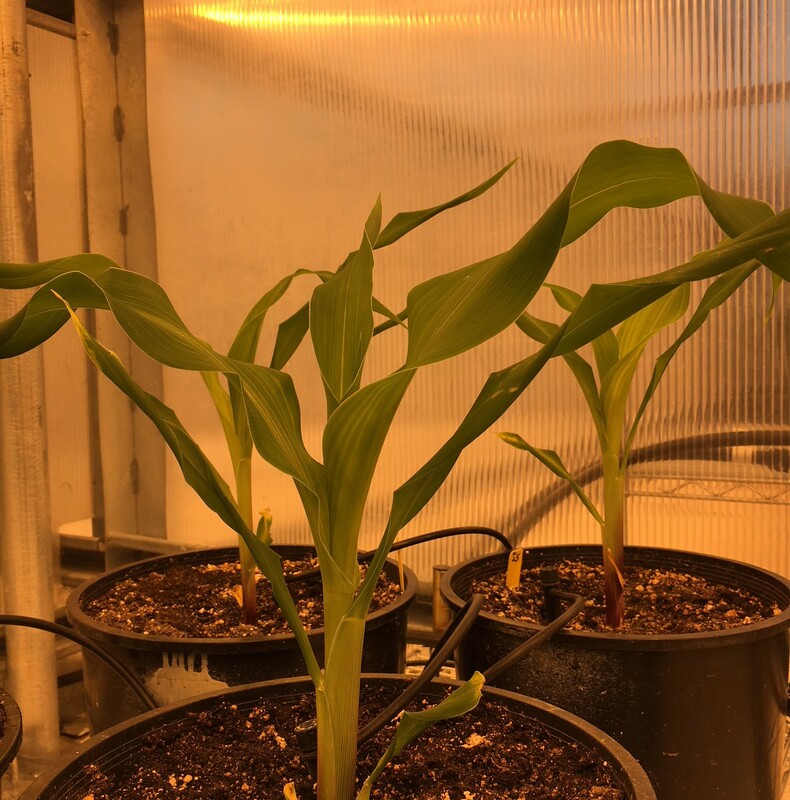 The researchers will use the maize plant, shown at left under greenhouse lighting, to inject biomolecules deep into plant cells with their new “gene gun” for genetic manipulation. A fourth grant will go to a team that includes materials physicists at the Geophysical Laboratory Tim Strobel, Ron Cohen and Li Zhu, in collaboration with Plant Biology’s Proteomics Facility Director Shouling Xu. 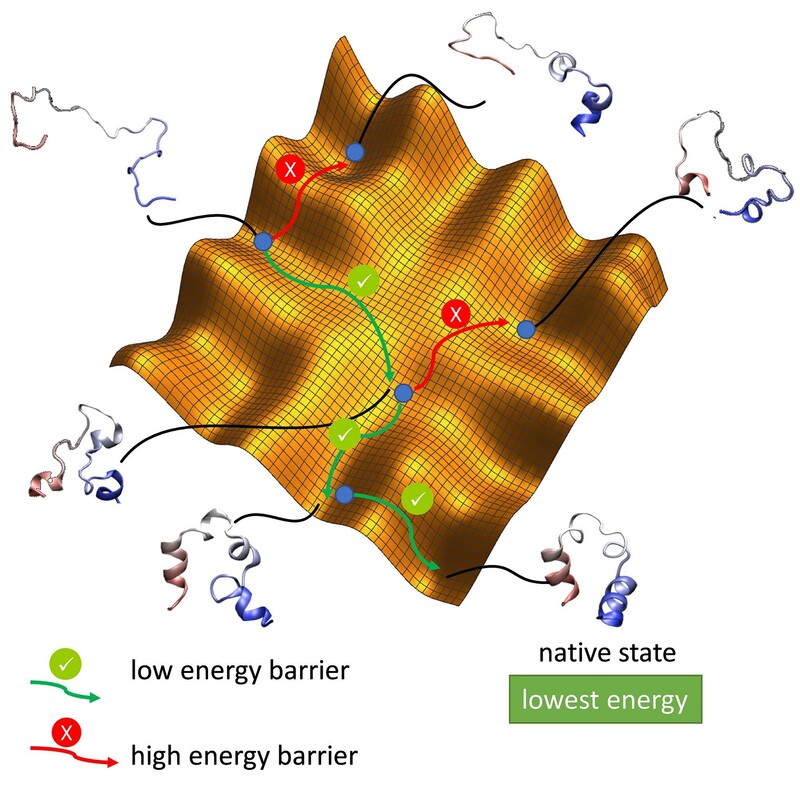 The team will apply their new computational method designed to understand materials synthesis to the biological problem of understanding the mechanisms of protein folding, which is vital to life. Misfolded proteins are believed to lead to many diseases. The team hopes to help bridge the gap between known protein sequences and protein structures. This image is an example of a modeled biological protein fold using techniques from materials science. Like an activated phase transition—such as graphite to diamond—in any solid-state material, proteins fold by changing configuration with associated energy penalties and benefits. For decades, astronomers have taken 2­-dimensional images through filters to try to understand the processes inside galaxies such as the ages of stars and whether they host black holes. But the image information is limited. To determine more detailed information on galaxies, such as their motions, finer frequency information is needed. Juna Kollmeier and Guillermo Blanc of the Observatories will use new mathematical techniques to interrogate data from Integral Field Unit Spectrometers (IFU). These instruments take spectra at multiple locations within a target such as a distant galaxy. The “data cubes” from these instruments are extraordinarily rich and complex and the team will be applying algorithms developed in mathematics and computer science to extract features and remove noise from these astrophysical data. The researchers learned of the method during a visit to the Scientific Computing and Imaging Institute (SCI) at the University of Utah, where Bei Wang Phillips and collaborator Paul Rosen have been working to analyze similar data cubes taken at radio frequencies with the ALMA telescope in Chile. These techniques are only accessible to the Carnegie researchers via collaboration with SCI. They hope this is the beginning of an exciting joint venture with SCI on theoretical and observational data analysis. The funds will support a student to work closely with the team to apply the new mathematical techniques to optical spectroscopic data. Below: The images show a 2-dimensional observation ([a], left image), which could be rendered as a 2-D projection of a 3-D structure with much finer resolution using the new mathematical technique ([b], right image). The rate at which a planet loses heat determines its internal structure and its geologic activity. Compared to Earth, the geologic activity on the Moon and Mars stopped long ago as did Mars’ magnetic field, probably from an abrupt decrease of heat flow. To understand what happened to Mars requires information on its interior structure and the mechanism and rate of the cooling. Thus far, such information is insufficient. Modeling planetary dynamics requires the knowledge of surface heat flux, which is highly uncertain at high pressure and temperature conditions of the mantle and core. Alex Goncharov of the Geophysical Laboratory and Peter van Keken of the Department of Terrestrial Magnetism will use their Carnegie Science Venture grant to measure olivine, the dominant Martian mantle mineral at high pressure and temperature using a novel technique. They will use the results to develop thermal evolution models for Mars. The new technique is a flash-heating method. A sample is compressed in a diamond anvil cell then continuously heated from both sides by an infrared laser to a stable temperature. Then, a second infrared laser delivers a pulse to one side of the sample generating a thermal disturbance. This innovation will enable the most accurate experimental measurements of thermal conductivity to date. They will then create 3-D thermal evolution models of the Moon and Mars. NASA will launch the InSight mission to Mars in May, 2018, providing the first seismic and surface heat flux data. The subsequent Carnegie model will incorporate InSight seismic results and surface heat flow measurements. This award will support a new GL-DTM postdoc and contribute to regular diamond replacements and to the team’s travel budget. Below: The schematic below shows the flash-heating diamond anvil cell method. Coral calcification and the future of reefs—Art Grossman of Plant Biology is teaming up with Global Ecology’s Rebecca Albright, Ken Caldeira and others to develop a new model for understanding how coral calcification works at the cellular/molecular and community levels. This blends fieldwork with understanding the molecular mechanisms that coral use to remove calcium and inorganic carbon from the seawater for calcification. The objective is to create a model to understand how the system is affected by climate change in the face of the growing global coral reef demise. The team will collaborate with the California Academy of Sciences to build a laboratory-based coral model system and focus on the critical larval and metamorphosis period to look at the DNA, RNA and proteins involved when cells begin to calcify. There is also the potential for a biomedical spin-off including the generation of bone material for grafting. How do plants sense temperature and time their flowering?—This team will investigate the molecular mechanisms that control how plants sense temperature changes. Temperature changes affect carbon fixation, development, the timing of flowering, and more. The timing of flowering is particularly important with global temperature rise. Embryology’s Yixian Zheng’s lab recently looked at how a protein whose transition into a liquid state at physiological temperature promoted a cell division process. That protein, BuGZ, belongs to a protein class called intrinsically disordered proteins and is similar to a protein called SUF4 involved in regulating flowering in plants. She is teaming up with David Ehrhardt’s lab in Plant Biology lab to determine if a similar temperature-dependent “phase transition” of SUF4 is required to regulate the flowering process. The Zheng and Ehrhardt labs will tag the protein to observe SUF4 behavior. It is uses temperature-dependent phase transition to regulate the flowering process, it would establish a new paradigm for temperature sensing in biological systems. Middle two images below: Embryology’s Yixian Zheng’s lab recently looked at how a protein, whose temperature-dependent transition into a liquid droplet state promoted a cell division process. That protein, BuGZ is shown in droplet form (second from left). She is teaming up with Dave Ehrhardt at Plant Biology to see if this transition to a liquid droplet state in a similar protein, SUF4, is involved in the flowering process in the model plant Arabidopsis ( third image from left) . C-MOOR: The Carnegie Massive Open Online Research Platform—This grant will establish C-MOOR (pronounced “See More!”), an internet resource that allows select Carnegie data sets to be easily accessed and analyzed by citizen scientists. Frederick Tan and Zehra Nizami of Embryology are teaming up with Terrestrial Magnetism’s Alan Boss, Sergio Dieterich and Johanna Teske (also with the Observatories) to combine Carnegie’s experience in cell, molecular, and computational biology expertise with astronomical and astrophysical observations and programming experience. Other like-minded Carnegie researchers are invited to help establish a community website with tutorials, discussion forums, an “Ask a Scientist” query portal, and other engaging features. This platform targets users seeking course credit, scouting, or merit badges as well as those driven by sheer curiosity. Top right image below: Most astronomical objects are known only as coordinate and brightness entries in astronomical catalogs. These catalogs have hundreds of millions of entries and the vast majority of them remain unstudied or even unnoticed by scientists. By partnering with citizen scientists to sift through these data we hope to learn more about stars both as individual objects and as a population. This image exemplifies the fact that for every star we study closely, in this case Luhman 16 at the center of the image (number 42), there are countless others that remain as mere numbers in a catalog. Could astronomical secrets be hiding in plain sight in images such as this one? C-MOOR will address this and other questions with the help of citizen scientists. Bottom right image below: Many of the modifications that occur in our genome are biased towards specific subsets of the 3 billion basepairs that form the fundamental building block of DNA. In this image, red regions represent changes in one type of modification, DNA methylation, that may alter the activity of nearby genes and transposable elements—segments of DNA that jump around—during mouse sperm development. Carnegie scientists are interested in understanding what predisposes particular regions of the genome to these and other changes. This vast array of information and more can be sifted through by the citizen scientists participating in C-MOOR. Image courtesy of Valeriya Gaysinskaya and Alex Bortvin. Sugar homeostasis is critical for health – both under- and oversupply cause cellular and organismal damage. The Farber Lab from Carnegie’s Embryology and the Frommer lab from Carnegie’s Plant Biology have joined forces to better understand the regulation of sugar transport in the vertebrate intestine. A novel sugar transporter discovered in plants (SLC50A; SWEET1) influences plant sugar transport, including plant vein loading, seed filling, gametophyte nutrition and nectar secretion. Interestingly, SWEET1 is also present in vertebrates and has been shown to transport glucose although we know very little about its specific roles in digestive organs like the intestine. Here we intend to establish the basis for understanding the role of SWEETs in humans by exploring the role and function of the single zebrafish version of SWEET1. Why are we performing this study in zebrafish? Because the larval zebrafish is optically clear, so we can deploy fluorescent biosensors, developed in the Frommer lab, that measure sugar levels by changing their fluorescent properties. The Farber lab has perfected ways of imaging the transport of another key nutrient (lipids) in single zebrafish intestinal cells so with these Frommer lab sensors they can more easily apply these same methods to the study of sugar transport. Currently, it is not possible to study subcellular nutrient transport inside a live digestive organ in a mammal like a mouse or human. We will use state-of-the-art genomic editing to create zebrafish with broken SWEET1 transporters (mutants) and study their phenotype and physiology with the help of theses glucose biosensors. It is our belief that the data from our studies will be relevant in the context of human nutrition, as well as diseases states such as Diabetes. Traditionally, carbon isotopes have been used to trace the movement and cycling of carbon between the atmosphere, oceans, and shallow subsurface environments. As high temperatures cause a decrease in equilibrium stable isotope fractionation, it was assumed for decades that carbon isotope fractionation in deep Earth conditions would be negligible. However, this may not be true.The silicate Earth has a carbon isotope signature that is quite different from those of meteorites, and other planetary and asteroidal bodies. However, it is thought that Earth, Mars, and the asteroids all received their volatiles, including carbon, from a similar source. So why is Earth’s carbon isotope ratio so different? Is it plausible that core formation, the single largest physical and chemical event in Earth’s history, could change the carbon isotopic signature of the entire planet? And if so, what would that mean for the composition of the core?We will try to understand this paradox by testing whether the differentiation of Earth’s core from mantle could have been accompanied by a significant shift in the carbon isotopic signature of the mantle by: 1. Determining the carbon isotopic fractionation factor between metal and silicate at high pressure and temperature for the first time, and 2. Placing an independent constraint on the amount of carbon in the Earth’s core. Despite covering less than 0.1% of the world’s oceans, coral reefs harbor one of the most diverse ecosystems on the planet and are valued at ~$30 billion per year. Coral bleaching, a phenomenon whereby warmer-than-normal ocean temperatures stress corals causing them to expel the symbiotic algae living in their tissues, is one of the largest and most pervasive threats to coral reefs. In October, the National Oceanic and Atmospheric Association (NOAA) declared the third ever global bleaching event; the epicenter of this event is Hawaii, which is currently experiencing record-breaking bleaching due to ocean warming associated with El Niño conditions. To document the extent of this bleaching event, the Asner and Caldeira labs are joining forces in an exciting new project to apply cutting edge remote sensing techniques to the marine environment. Asner is an expert in ecological remote sensing and has been conducting research in Hawaii for over 20 years. Caldeira is a climate scientist who has been researching the impacts of climate change on coral reefs for nearly two decades. This partnership represents an exciting new direction that promises to unfold relationships between ocean warming and coral stress, providing scientifically robust information to inform decision-makers and guide conservation-management. What question does this work aim to address, and why is it important? Why are this team and this approach well suited to investigate this question? How does the project differ from prior work, on this topic and by the participating scientists? What is the potential for discovery or technological innovation with the work proposed? What does the team expect to be the greatest challenges? How will the team measure success? What critical resources would this award enable? Describe the budget. The review panel will consist of a representative from each department along with possible members from the Board of Trustees. Geophysical Laboratory Staff member, Anat Shahar, will serve as chair for this round of proposals. Award recipients will report on their progress at the halfway mark, i.e., after one year, and at the conclusion of the project period. The lifetime of the award begins at the first expenditure. No-cost extensions are possible if approval is sought more than six months before the end of the project period. Proposals should be led by at least one Carnegie staff scientist. Teams that include staff from more than one department are encouraged but not required. Collaborations with scientists from outside the Carnegie Institution for Science are fully eligible for these awards. However, the awarded funds may not provide direct support to other institutes (e.g., funds may not support a faculty salary at another institution or the purchase of an instrument that will not ultimately reside at Carnegie; a joint studentship or postdoc is an example of an expense that could be supported). In reviewing proposals, the panel will consider the following potential strengths and weaknesses. These lists also reflect the discussions of the inaugural panel and their subsequent rankings. Representative comments similar to those made by the panel are given in italics.